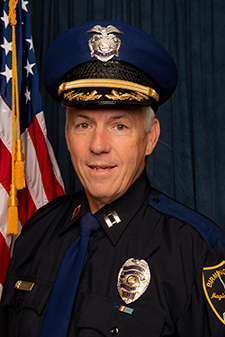 Captain Allen Hatcher has served the City of Birmingham for over 35 years. He began his career in 1983 and upon graduation from the Birmingham Police Academy he was assigned to the East Precinct. In 1986 he was assigned to the Mounted Patrol Unit. In 1994 he was promoted to the rank of Sergeant and was assigned to the Tactical Unit. In 1999 he was promoted to the rank of Lieutenant and assigned as the Evening Shift Commander at North Precinct. He was later assigned as the Director of Training at the Birmingham Police Academy. In 1999 he was promoted to the rank of Captain and was assigned to the East Precinct. In 2013 he was assigned as the Executive Officer to the Chief. In 2015 he was promoted to the rank of Deputy Chief and was assigned to the Field Operations Unit. In 2018 he was assigned as Captain to the East Precinct.